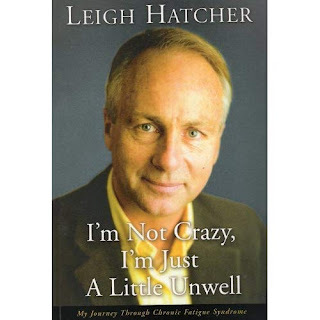 Leigh Hatcher’s book about his years suffering with Chronic Fatigue Syndrome nearly had a completely different name. But all along he’d felt the Matchbox 20 lyric I’m Not Crazy, I’m Just a Little Unwell seemed to resonate with his experience and so he went with his heart and it became the title of his best selling book. And that’s something Leigh is good at, going with his heart, and he bares plenty of it in this riveting story of one man’s crash out of life and into a world of misunderstood and often mysterious sickness. In his preface, Hatcher - one of Australia’s best known journalists, news presenters and authors - explains that ‘no two CFS stories will ever be the same’ and so it is fitting that he simply tells his story, with its backdrop of iconic political moments, Olympic excitement and the inner workings of television and radio. In a tightly written book that moves along at a clipping pace but still manages to pack in plenty of detail, Hatcher describes his fascinating life before CFS and how he was poised to be the Seven Network’s chief Olympic reporter for the Sydney 2000 Games for which they had the television rights. But in January 1998, with the Games now almost in sight, his body all but gave way on him, plunging him into pain, exhaustion and a powerfully toxic feeling that he mentions many times during the book. Like many people with a less obvious illness, it took a long time for a clear diagnosis and so he simply hoped that with a brief period of rest he would be over whatever had struck him and back into his full and varied life. It didn’t happen and as he grew perplexed as to what was causing his debilitation, many of his friends and acquaintances simply lost patience, or perhaps interest (echoes of the Matchbox 20 song) and began hinting, or even saying directly, that he somehow must want to be sick, or that it was somehow all in his head. Hatcher points out that it is this pain, the suffering caused by people’s doubts, desires to ‘fix and outright rejection, that hurts almost as much as the illness itself. He describes his ups and downs with CFS, his desperate search for answers, the many false trails, the suffering of his family and his own despair. His recounting of how his young daughter beat him in and arm wrestle is one especially poignant indication of how hopeless and sick he felt. In the midst of that we see him fighting back by finding things he could do (such as learn ancient Greek), even with limits, and also see a resilient Christian faith that held him fast despite everything he was going through. He describes many of the tests and treatments he encountered and this will resonate with many other CFS sufferers but may also provide some informal, non-medical insights into things to consider for those new to the illness. Finally he describes the exhaustive insulin and blood sugar tests, the findings (not diabetic but other irregularities) and the diet and exercise plan that helped him turn the corner after two dark years. The latter part of the book describes him re-entering his life and finding his way back into Olympic coverage, although not in front of the camera, but as a senior producer on one of the main shows each day during the Games. As we see the incredible pace he picks up, all the while following his new health regime, it is as if Hatcher is thumbing his nose at the naysayers who had previously implied he was just wanting to opt out of the responsibilities of life. Not exactly the picture we are left with. Anyone who knows Leigh Hatcher, and his career before and after these missing years, knows there is barely anyone anywhere with as much zeal, passion and energy for life. The fact this is the case after what he has been through is a testament to the treatment breakthrough, his faith and the prayers of many, and his own indomitable spirit. Let’s hope many people with CFS continue to read this book for its timeless encouragement and that many of their family, friends and acquaintances will take the time to learn more by delving into its pages.